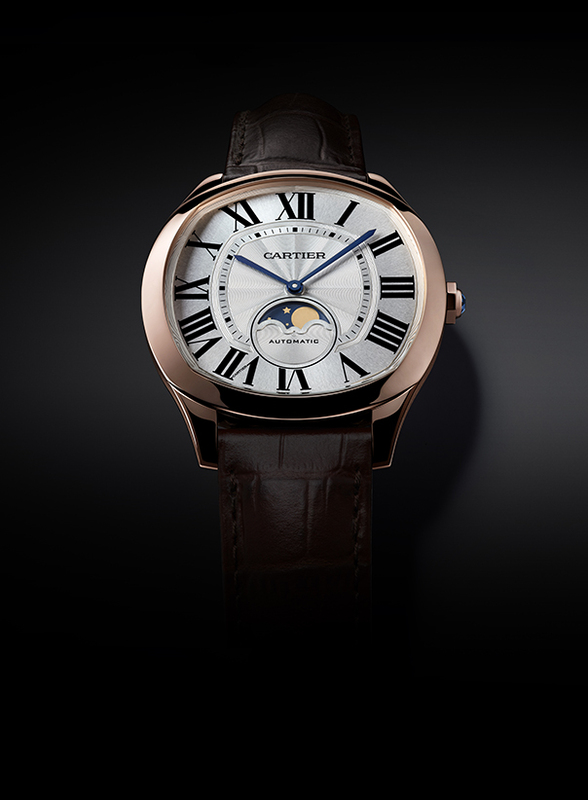 For SIHH 2017 Cartier has returned to a signature of the 1980s, the Panthère de Cartier. The irrepressible symbol of decadence and luxury, immortalised by its male counterpart worn by Michael Douglas in Wall Street returns as the penultimate feminine ornament – a delicious yellow gold bracelet watch, jewellery first and timepiece second with comfortable flexibility all thanks to newly engineered bracelet straps. 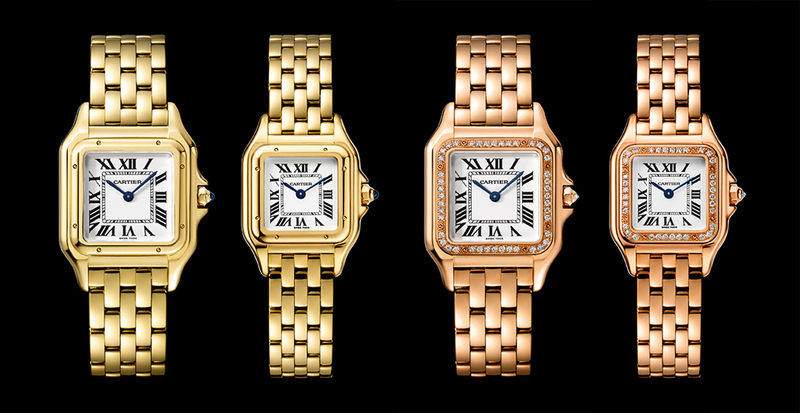 In the 80s, Cartier was visual shorthand for luxury. 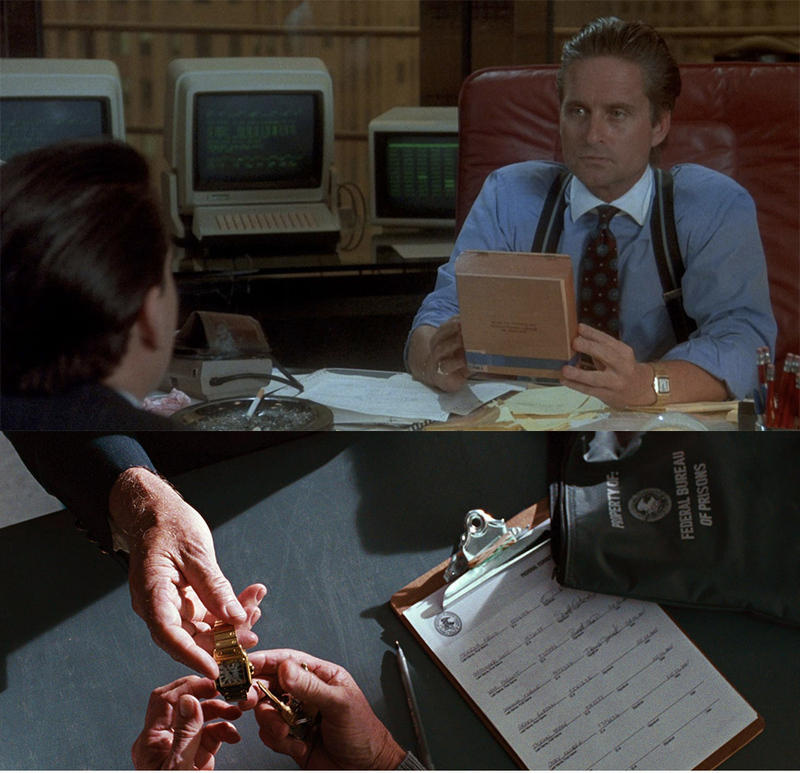 Gordon Gecko with his Cartier Panthere in Wall Street and once again as he leaves prison in Wall Street 2. Although the Panthere de Cartier watch collection is primarily Quartz based, the series follows the maison’s purist aesthetic to sublime proportions – the result is an SIHH 2017 collection which is an immortal classic and signature timepiece in horological history. More importantly, it marks the comfort zone of the maison in declaring that in this series, it’s jewellery before it’s a watch. 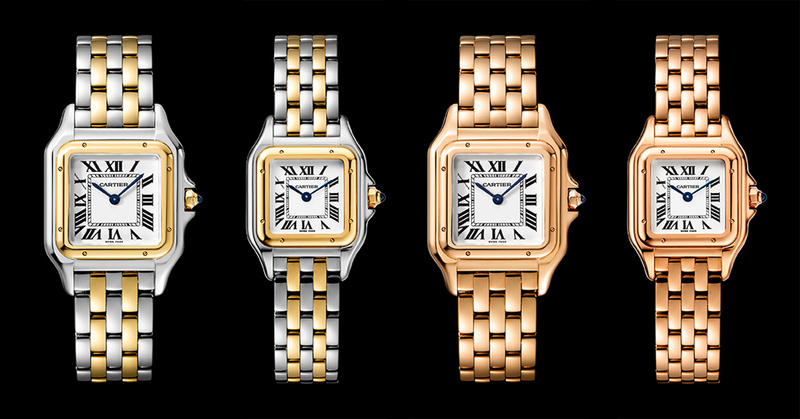 From left: Panthere de Cartier watch medium model, yellow gold – €18,500; Panthere de Cartier watch small model yellow gold – €16,000; Panthere de Cartier watch medium model, pink gold paved bezel – €22,000; Panthere de Cartier watch small model, pink gold, paved bezel – €19,000. 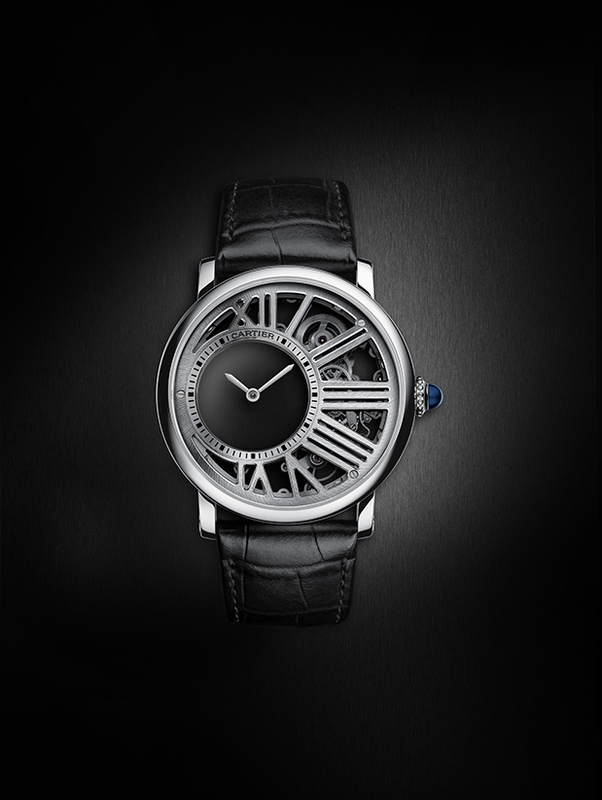 Launched in 2016, the Drive de Cartier was designed as a stylish man’s watch to be dressed up as a dapper gent’s black tie dinner companion or dressed down as part of a chic denim ensemble. For SIHH 2017 Cartier adds more expressions for fashonistas in the form of two new faces of the Drive de Cartier watch. Suave sophistication in the form of a new moonphase complication and an extra flat model joins the existing Drive de Cartier collection from last year which formed the foundational core of the collection – an hours, minutes and seconds watch, a second time zone model and a flying tourbillon. The two newest faces of Drive de Cartier while launched at SIHH 2017 is no doubt equally at home if launched by Cartier once again at the Pitti Uomo menswear trade fair in Florentine’s Palazzo Gondi. Fitted the new Manufacture movement 1904-LU MC, the Drive de Cartier Moon Phases is a distinctive watch equipped with moonphase complication displayed on a subdial at 6 o’clock, tracking the cycle of new moons, half-moons and full moons whilst only needing correction by a day once every 125 years. The uncluttered white guilloche dial protected by the convex curved glass carries the signature design of the original Drive de Cartier collection launched last year, exuding elegant machismo with ease in either pink gold or steel. Driven by the hand winding mechanical calibre 430 MC, the Drive de Cartier Extra-Flat is textbook definition of the maxim “less is more”. Its slender profile caresses the wrist ever so tightly yet gently, speaking volumes with its soft-spoken minimalism and at less than 7mm thin, it is 40% thinner than the original Drive de Cartier. Sunray satin finished dial is further accentuated by the random lines and grooves of a finely crafted alligator-skin strap – perfect for wear under the sleeve of a dinner jacket. Available in pink gold, or in a limited edition of 200 pieces in white gold. 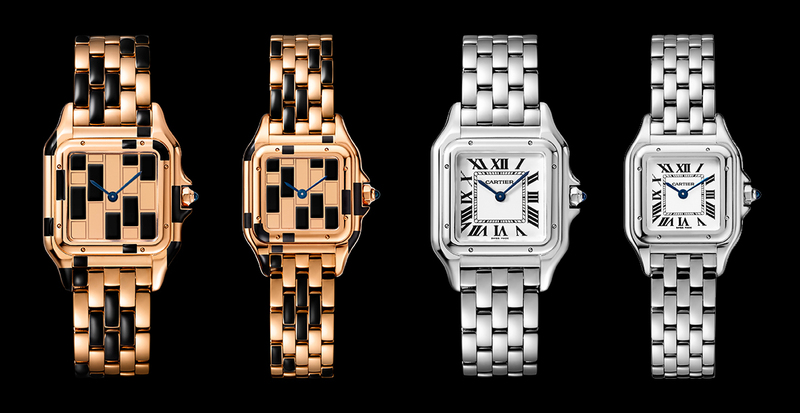 Expressing the myriad of metiers d’art practiced by the maison, the SIHH 2017 Cartier Exceptional Watches collection is a combination of high jewellery and high complication timepieces which best demonstrate the watchmaking prowess of the jeweller. Which artistic craft has Cartier mastered to create a dial with the luminosity of enamel and the precision of a miniature painting? This Ronde Louis Cartier watch pioneers a new technique in watchmaking: amed gold, the latest addition to the repertoire of Cartier craftsmanship. The depth of a rich animal palette ranging from beige to brown is contrasted with blued apple-shaped hands. Cartier has chosen to pave the bezel of this exquisite timepiece in baguette-cut diamonds, a flash of fire that brilliantly illuminates the genius of the artwork. The creature is strikingly lifelike. Flamed gold is the latest technique in a repertoire of Cartier crafts that extends to Etruscan granulation, enamel granulation and filigree work. 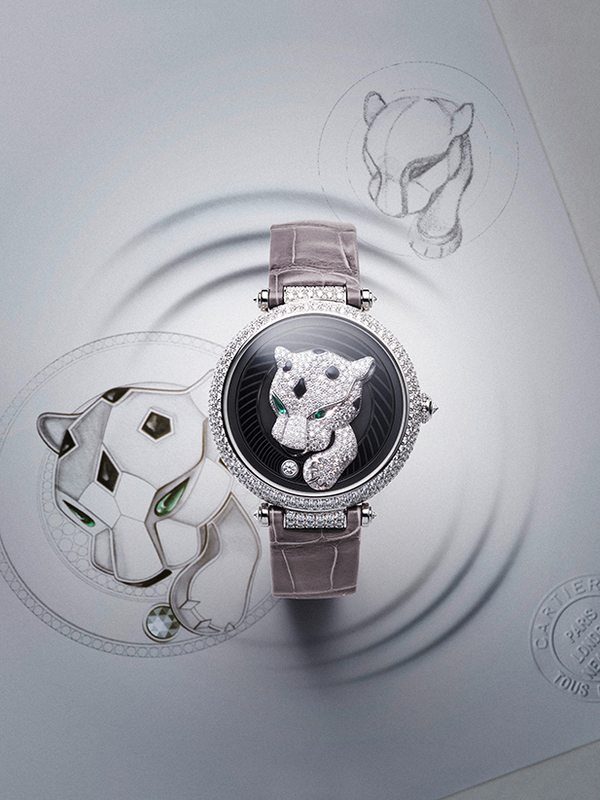 Within the Cartier menagerie sits the maison’s iconic panther. 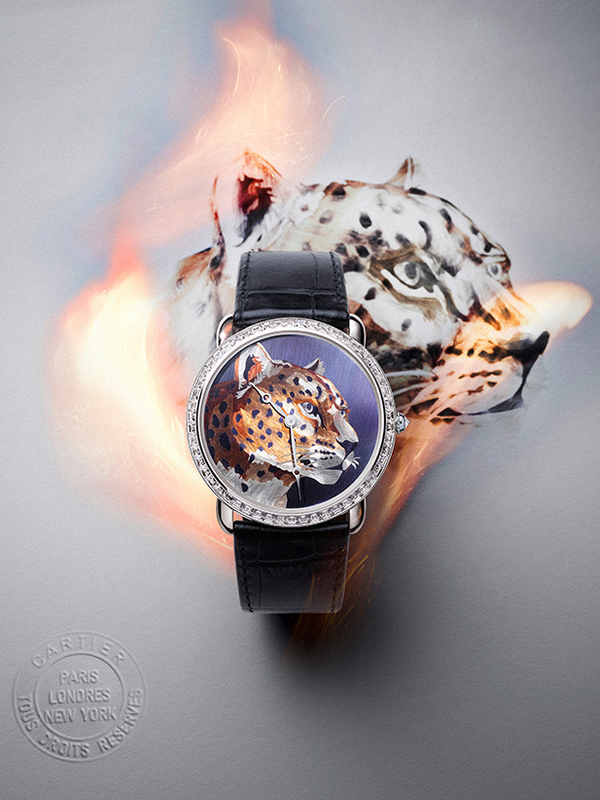 On the Panthere Joueuse for SIHH 2017, the Panthere is in a playful mood pawing at the hour positions as a live feline would. The creature of mirth and merriment appears to be pouncing around the dial using its front paw to indicate hours while the minutes are shown by way of a bejewelled “ball” making its way around the dial. Art mimics life like the hapless cat in constant pursuit of the laser point, a predator never catching its prey. Exhibiting exquisite craftsmanship in a display of diamonds, black lacquer and emeralds, Cartier brings the panther to life with a new Calibre 9918 MC movement also used in the Drive de Cartier extra flat. Two demanding complications meet one mysterious movement in the Rotonde de Cartier Minute Repeater Mysterious Double Tourbillon for SIHH 2017. At the fore, it’s a technical feat of 448 components in a 11.15mm thin case. Second, it’s an artisan’s challenge with open-work mechanism and finishing on a variety of surfaces including contrasting black rhodium to further enhance the transparency and mystery of the double tourbillon. Finally, there’s the high bar of meeting the challenge of constructing an on demand minute repeater. Continuing a poetic complication inspired by the first Cartier mystery clocks in 1912 the new Rotonde de Cartier Minute Repeater Mysterious Double Tourbillon perpetuates the tradition with its magical 60 second flying tourbillon which appears to orbit its space sans tether. The sapphire disc which holds the tourbillon aloft itself completes one rotation every five minutes. Ready yourself for a spectacle beyond the tourbillon when you spy the action of the minute repeater hammers visible at 6 o’clock. According to Cartier spokespeople, every effort was made to maximise the four qualities (loudness, timbre, richness, duration) vital to the acoustics of the Minute Repeating Rotonde de Cartier watch with calibre 9407 MC. Yet, we must confess that the titanium case prototype did not live up to our expectations but we must provide a caveat – it was a fairly noisy presentation room. Mysterious movement and skeleton work, two of Cartier’s Fine Watchmaking flourishes join in the manufacture’s first much akin like an illusionist performing sans distraction. 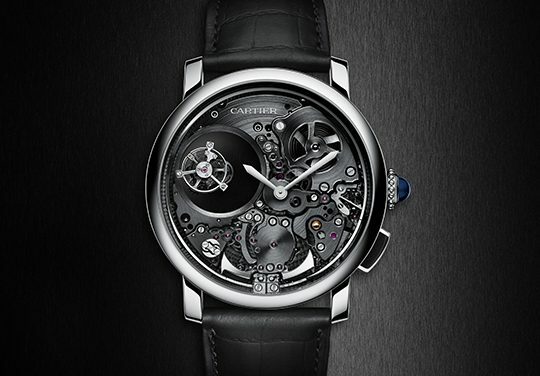 Everything is laid bare for the Rotonde de Cartier Skeleton Mysterious Hour and its calibre 9983 MC. 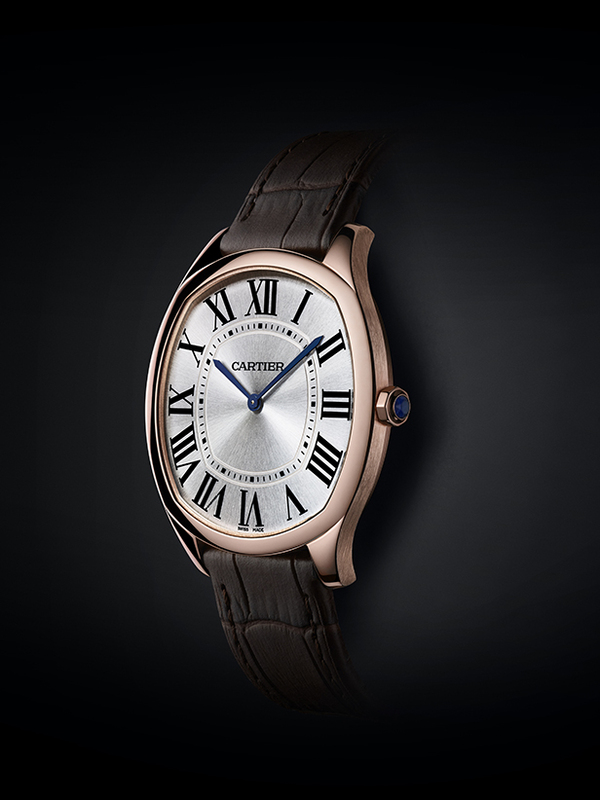 Part of the Mysterious Hour’s appeal is the magic of not being entirely sure how the mechanism works to drive the hour and minute hands which appear untethered but with the asymmetrical and structured two-sided movement leaving no avenue for deception, this is where the stylistic audacity and technical mastery of Cartier comes to the fore. The hands are not directly linked to the movement, but are joined to two sapphire discs fitted with teeth around their circumference. Yet, even skeletonised and exposed, it’s still hard to be sure and therein lies the appeal of the Rotonde de Cartier Skeleton Mysterious Hour. 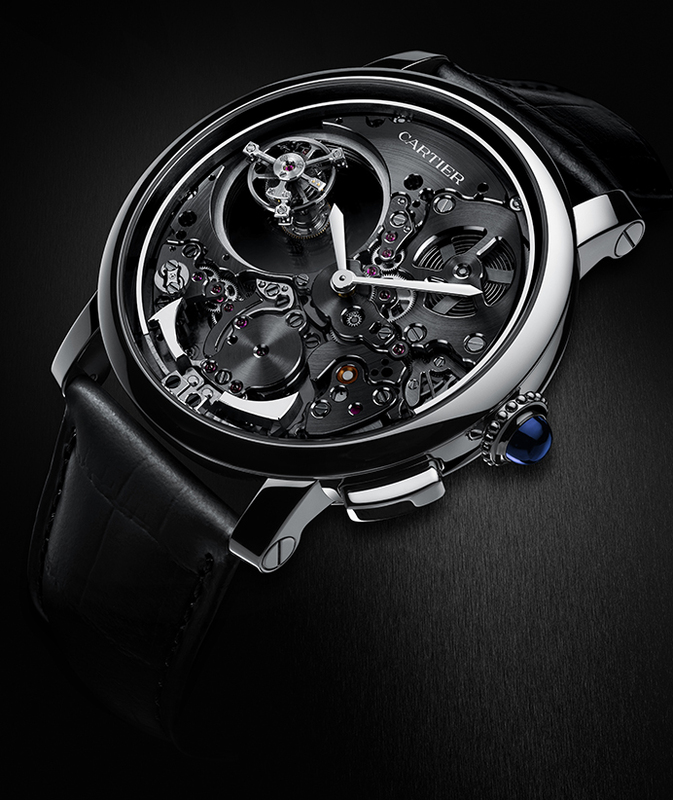 With the calibre 9983 MC, Cartier decided to reveal the gear train of the mysterious movement, which as a rule, magicians are wont to do but this transparency only heightens the magic and wonder because while it is reveal, it unveils nothing of the mechanism nor its magical properties.